This past week, I haven't felt as helpless or as vexed behind the wheel since I was 15 years old and trying to divine the magical balance between clutch and gas pedal that actually sent my mother's BMW 325e forward along our farm's gravel road. Each time the vehicle shuddered and stalled out, I was left to contemplate my own futility, understanding there is no way a driving machine like this would be made, marketed and sold if it truly was inoperable. I had to be the problem. F1 2012 raised the same feelings in me. It is the most demanding racer I've ever played, and yet I'll surprise myself and also call it one of the most accessible motorsports simulations available. Make no mistake, to get a fulfilling experience from F1 2012 you must honestly judge your familiarity with simulation racing, and with Formula 1, before embarking upon this game, the third F1-branded offering from Codemasters, the leader in motorsport videogames. F1 2012 contains a deeply customizable set of controls, preferences and game modes that can get you on the track under circumstances that minimize your failings and challenge your strengths without patronizing you, even in its most arcadelike settings. But the replay value of F1 2012 is low if you can't or won't grow with the game. If you lack the commitment to spend serious time becoming a better driver, this will be a weekend fling and a trade-in with regret. WHY: F1 2012 offers a stout challenge feathered by accessible difficulty settings and playing modes, indulging race fans without pandering. Type of game: Motorsports simulation. What I played: Split roughly 20 career races over the game's Season Challenge and Career modes on Xbox 360 and PS3, racing all 20 courses offered. Dabbled in the Time Trial, Time Attack and Champions Mode without getting very far. Projects authenticity throughout and conveys a satisfying thrill in successes large and small. Varied game modes and customizable control sets and assists mean no fan is left out. Like wine, it can be both a good friend, and a terrible master. Higher difficulties require strong persistence and self confidence. Main career mode remains spartan, and the one-year "Season Challenge" lacks purpose once you make your preferred driving team. Motorsports simulations have three prime areas of responsibility: They must offer exacting realism in their courses and in their vehicles' handling, and they must offer a way to deliver a satisfying competition without holding you to driving 90 minutes or more real-time. Atop this they must offer stunning visuals, even if your opportunity to appreciate them is measured in milliseconds. F1 2012 succeeds at all three. In terms of the physics, I came to F1 2012 as an arcade racer. I feather my brakes before the apex, drift into it, and then hit the gas, flick-steering afterward to make any needed corrections to my trajectory. I'm slow, in other words, even though I spend most of my time clenching the gas with my right finger. This is not going to get you very far in F1 2012, where rubber-banded AI is non-existent at any setting. Even on the most permissive difficulties you will only make up time by braking and accelerating correctly and taking advantage of the opportunities afforded by the course's layout. In those moments where you brake properly and slingshot out of a turn into the proper racing line (which can be toggled on or off), especially in the 15th turn at Melbourne or a hairpin like Monza's Parabolica, F1 2012 is at its most rewarding. The game expects this of you in every turn, every race, however. Making up time in qualifying, or against a teammate, or rival in the career modes can be a grindingly frustrating process, even with the DRS and KERS systems—which are basically speed-boost modifiers available at certain times in a race. In many qualifications I'd end up fourth, 11th or 18th, with eye-rolling predicatability. In races I often found myself all alone in fifth place, the top four cars well out in front by two seconds, racing technically sound, the rest of the field well behind, and me in the middle embodying the qualities of both—punishing those behind me with my raw speed and teeth-gritting determination through mistakes, and yet unable to close the gap and get to the podium. When this develops early in a race, you may wonder why you're continuing to drive so, again, consider your level of commitment—do you want to run 25 percent of a full race (15 laps), half, or a full run? In visuals, short-distance redraws were only an issue for me on reflected surfaces (the glossy hood of my car, sometimes causing me to look at my mirrors for an attempted pass that wasn't there). 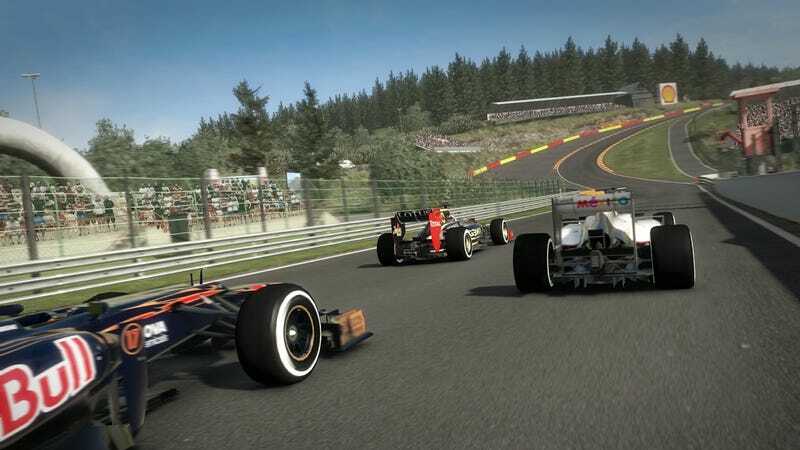 In the main landscape, while I lack real-world familiarity with the 20 courses offered in F1 2012 I can say that after repeatedly hurling myself at the gut-sucking Eau Rouge uphill at Spa-Francorchamps, F1 2012 delivers a powerful sense of place. This is key to the big strategic expectation of a simulation racer, course familiarity. Former F1 driver Anthony Davidson provides a very entertaining analysis of a single filmed lap, identifying the turns, brake points, gears and speeds you should be hitting through an ideal run. You see this in the career mode's main hub, before you load the event, so there's always a time gap between watching that and going onto the track. But there also seems to be no way to take a simple free-run practice lap at your next event's course within the game's two career modes. You would have to do that offline, and given the loading times between modes, often you just want to get on with the race and learn what's expected of you in qualifying itself, which is a poor approach. Qualifying in the rain at Autódromo José Carlos Pace, São Paulo, Brazil, in F1 2012's sensibly abbreviated Season Challenge mode. Finally, in event variety, you can select anything from a full-distance gran prix, with long weekend qualifying, to one-lap qualifying and a distance one-quarter of the standard laps. Brace yourself, though, the longer formats are authentically demanding of your attention. As the main career mode is largely unchanged from F1 2011 the mode most F1 2012 drivers will likely use first is the new Season Challenge, which gives you 10 grands prix as opposed to 20, and spices up the season by allowing you to choose a rival driver to beat in a personal two-of-three series raced over the course of the season. However, I was struck by the fact in a career mode you may only race as yourself, not any of the licensed drivers who appear throughout the game. That seems to be a needless limitation. Winning out in those mini-series means you get a contract from your rival's racing team, which is flattering as you progress up to one of the standard-bearing teams like Vodafone McLaren Mercedes or Scuderia Ferrari. But the mode loses all purpose once you achieve your preferred driving team, leaving you to name an inferior rival and receive contract offers from a team you don't wish to drive for, until the end of the season, which results in a series championship or starting over. As demanding as F1 2012 is, its expectations are not arbitrary (well, they can seem that way if you're not familiar with F1 rules. I turned on realistic course rulings and was flagged several times for illegal blocking even though I thought I did nothing wrong. Blame it on my upbringing in NASCAR country.) At every point I knew what I did wrong. The brake assist on the lowest difficulty should only be used for a brief introduction into hitting the apex of a turn, if you're not familiar with that expectation in a motorsports simulation. If you can't graduate from that to competent racing in three or so events, despite your ardor for F1 racing in the real world you may need to evaluate your appetite for this sport in a video game. F1 2012 still is seductively deep in the challenge it offers and it what it asks of you. At best, I fantasize that turning off all assistance—pit road, traction, driving line, etc.—and winning a race against expert difficulty, would legitimately qualify me as a championship driver in real life. At worst, I feel it would take one to win in this game.